Recently we have been working on skills to help Buddy feed himself with a spoon by incorporating scooping and dumping activities into our play. 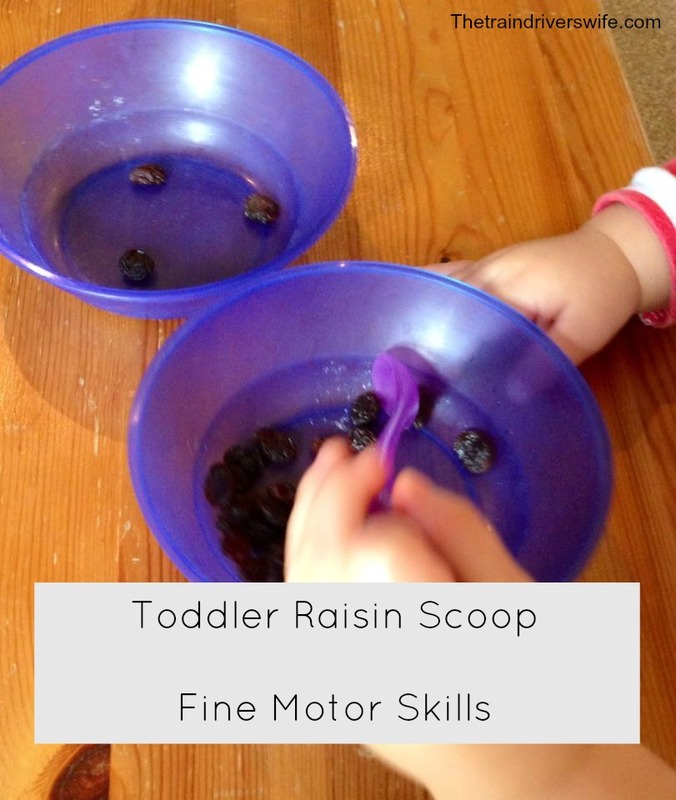 This will (hopefully) help him to master those tricky fine motor skills he needs to scoop up food, hold the spoon steady and direct it towards his mouth. I love to incorporate as much learning as possible into any activity, even snack time, so this activity was a great way for Buddy to practice his skills and also fill his belly! Snack of your choice – we use raisins because they are easily cleaned up, they don’t stain and Buddy loves them. An appropriate spoon – I use long handled spoons with a deep scoop because they are a bit more difficult to spill. This wasn’t really a truly autonomous play. If I hadn’t guided it Buddy would have munched the raisins without even attempting to touch the spoon. I poured the raisins in one bowl and set the other next to it. 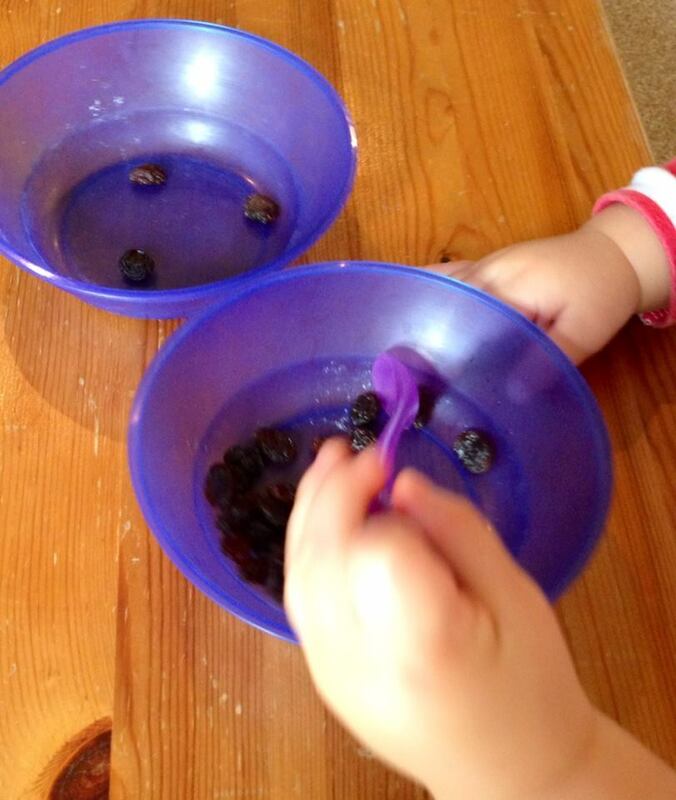 I then scooped some raisins into the spoon and dumped them into the empty bowl. I applauded myself rapturously (well I was very good at it!) and encouraged Buddy to have a go. Buddy decided to play with the empty bowl first. Bowls are Buddy’s hat of choice. After a quick rendition of “Buddy has his hat on” we were ready to practice scooping. Buddy started with his left hand. 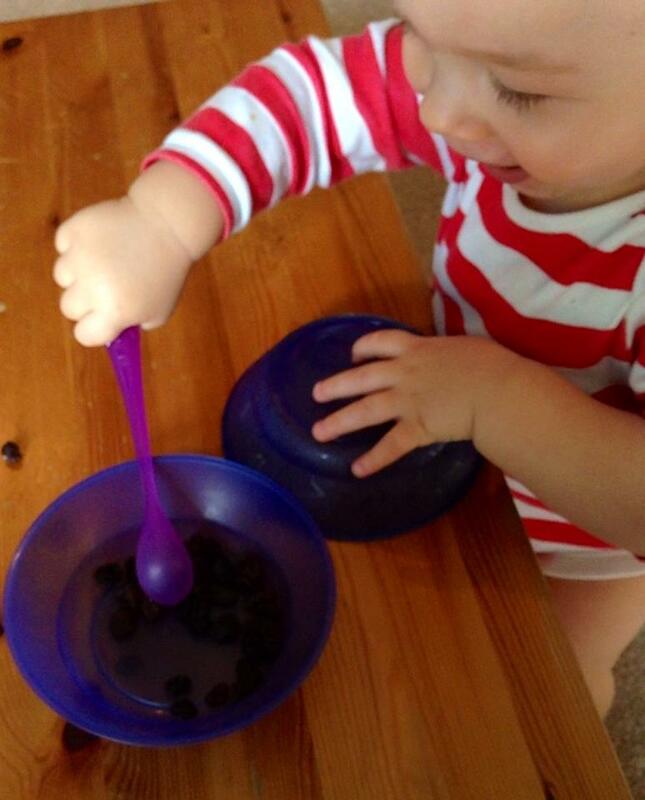 His spoon grip is really quite good and he managed to get a few raisins into the bowl. 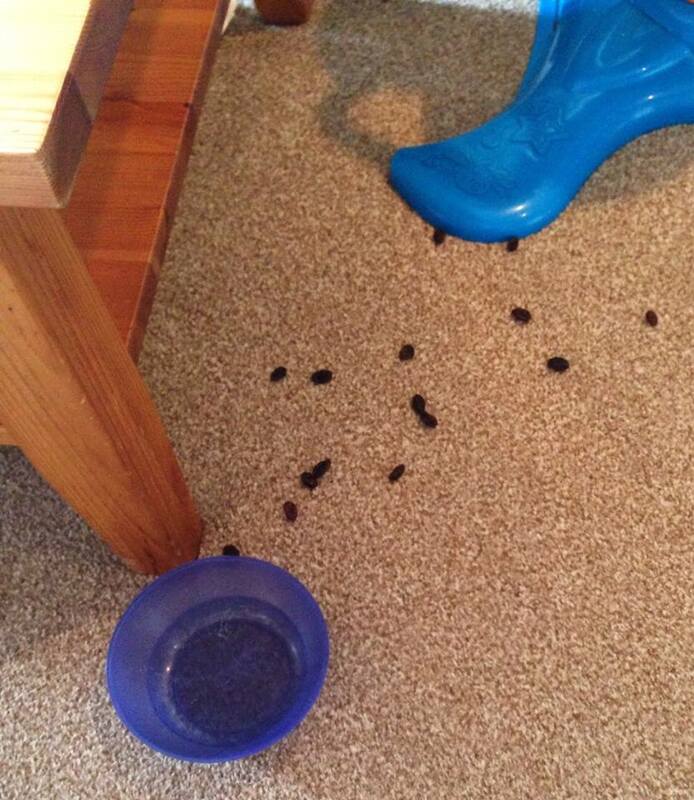 He got a little bit excited by his accomplishment, I think I may have gone slightly overboard with the clapping and cheering, which resulted in this happening… That’s why we use raisins! I set up the bowls again, right handed this time. 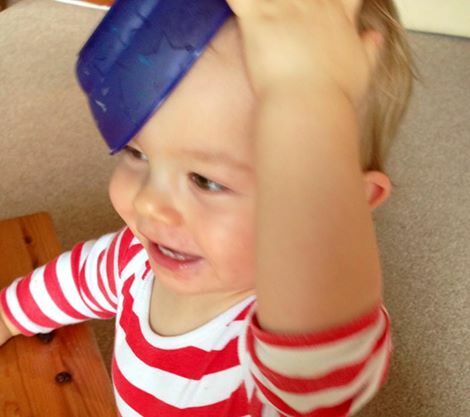 Buddy tried to use his left hand and then worked out that it would be easier to use the right – good lateral thinking for a little guy! He enjoyed scooping, stirring and dumping the raisins for a while longer, occasionally reaching in to eat them when he thought I wasn’t looking. 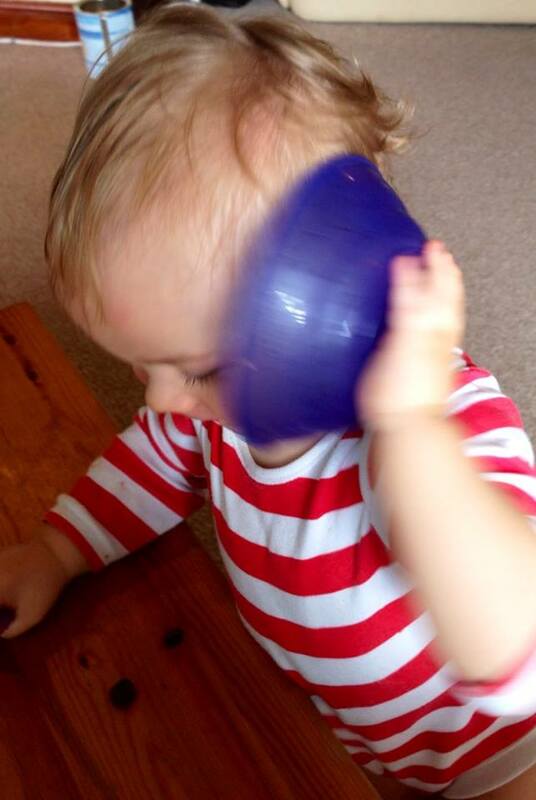 Then it was time to play with the bowl again. Nope, it didn’t sound like the sea. Buddy had fun with this activity and it was so simple to set up. 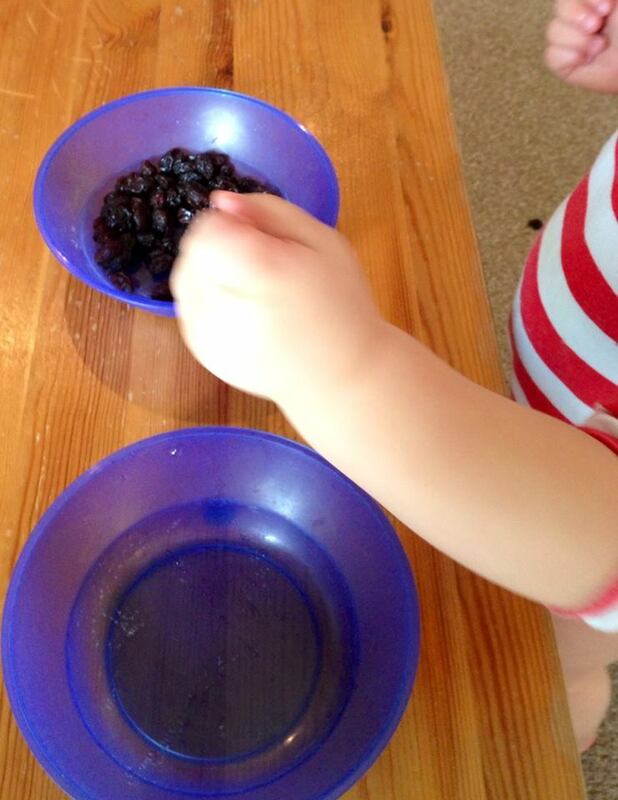 Buddy was working really hard on his fine motor skills here and he did great at scooping up the small raisins. Not many made it from the spoon to his mouth, but we’re getting there! Please feel free to leave me a comment, I love reading them and always welcome new ideas. This is a great idea. I’m a little worried my baby will just eat all of the grapes because he loves them, but we’ll have to try it out! Maybe we’ll do it when he’s not so hungry. Haha, Buddy likes to eat his too but then that’s part of the fun!